SHAMBHALA takes its name from a legendary kingdom famous for being an enlightened society, based on trust in human dignity. We offer a path of meditation practice and contemplative arts oriented towards modern life. Our communities around the world cultivate kindness, bravery, and genuine dialogue. Our vision is to inspire compassionate, sustainable, and just human societies. Getting involved in Shambhala is a chance to participate in a “living lab” for creating good human society. We welcome those of any background, culture, faith or walk of life – all are welcome! At Open Sky Shambhala, we have two paths of membership: Friends or Sustaining Members. While we appreciate any donation in any amount at any time, recurring monthly dues enable us to budget and plan for upcoming expenses, allowing our meditation center to remain open and viable. Those who believe deeply in the power of meditation and wish to help create enlightened society by supporting a place that allows the practice and study of meditation & teachings to flourish. We acknowledge that people may have other lineages and/or traditions they devote energy to, or that perhaps life simply does not allow space or time for volunteering at this time. Your dollars help us to keep Open Sky functioning and accessible. A FRIEND can commit to regular monthly dues of $40 (or more). You may join us for meditation practice, dharma discussions, book study groups and community events as you are able, but there is no expectation that you give more than your heart and vital financial support. For the cost of about two Dutch Bros/Starbucks coffees or a lunch out once per week, you can make a significant difference in “Making Enlightened Society Possible.”Friends have the added benefit of being able bring a friend to a class/course for a 50% discount once per year! The Practice of Community/Society: Shambhala is a community that practices teachings on basic goodness and explores how to create a culture within our communities that embodies that profound principle. Membership offers active engagement in contemplating and building a different kind of society altogether. Meditation Practice: A member of Shambhala makes a connection to mindfulness-awareness practice and works to integrate that practice into daily life in order to create a foundation for healthy relationships and an enlightened society. This connection may also be made through contemplative practices based on mindfulness-awareness. 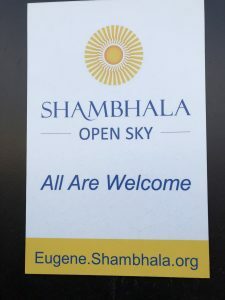 Volunteer service: All Open Sky Shambhala activities are conducted by volunteers, and we can use your help. Members donate time based on interests, skills and personal availability. 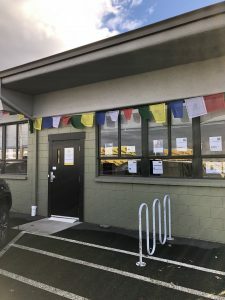 Financial Support: When one becomes a sustaining member, your financial contributions support the needs of our local center as well as the international Shambhala organization. Dues can always be tailored to one’s individual financial situation. Shambhala International: For advanced programs within Shambhala, one must be a sustaining member. When one becomes a Sustaining MEMBER, we offer a Membership Oath Celebration and Membership Great Eastern Sun pin at either the Harvest of Peace (September) or Shambhala Day (Tibetan New Year in Feb/Mar) festivals – two significant holidays in our Shambhala tradition. *Many find they are not able to contribute the full membership dues. That is perfectly “OK”! We need help with a vast array of volunteer-ship. This can range from help with cleaning the center regularly to assisting with hosting at our events and classes, to boosting promotion of our activities by posting fliers and to various online media outlets. Most volunteer activities require one to be a sustaining member. ….are you simply interested in a place to practice meditation? Help us keep the center open for public sitting! For just $20 (or more) per month, you are invited to join any of the public meditation events including Tuesday evening meditation, Learn to Meditate, book study groups, Meditation, Dharma & Discussion and other “by donation” public events.